I did get done today what I wanted – adding columns 4 & 5 to the developing quilt top. The two columns went quickly because I now understand what I’m doing – I didn’t when I began and the first few blocks took a bit of time. The process is now streamlined – four 6.5″ squares of pieced strips are stacked and cut into four irregular strips, laid out in order for the block, then stacked again so I can chain piece the narrow sashing to three, join the pieces and add the fourth; press, add the bottom sashing, press, add the side sashing then join the blocks in the column – it’s going quite quickly. 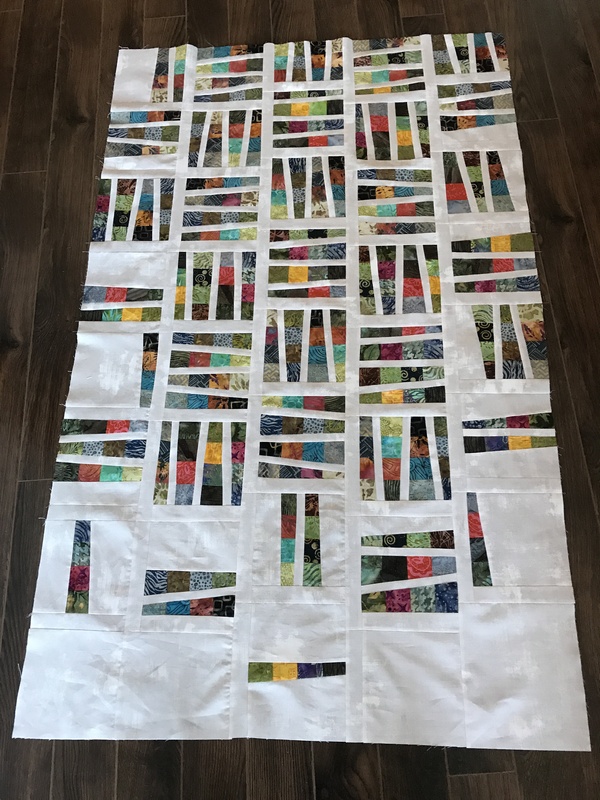 I have the cut strips for the sixth column prepared and laid out – tomorrow I will sew them, create the column, and add it to the other five. That will just leave the two narrow borders and the two wide borders to add. The top might be done tomorrow!